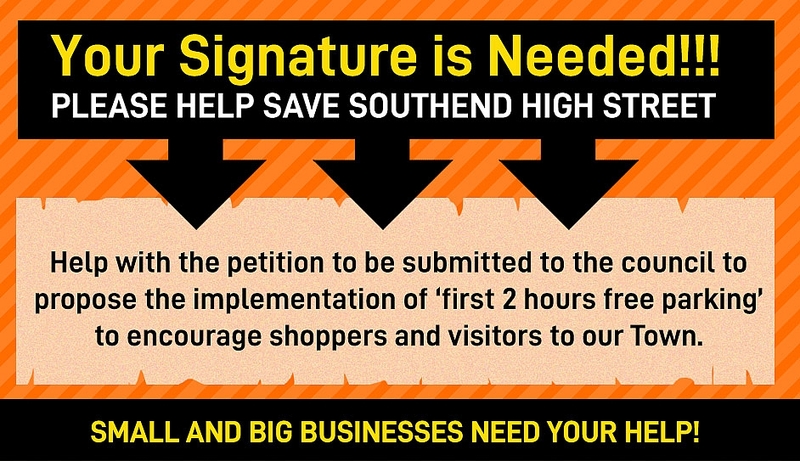 ﻿ Petition for 2 Hours FREE Parking to support local traders in Southend's High Street! Petition for 2 Hours FREE Parking to support local traders in Southend's High Street! We have been more than patient with the council, but time is now running out for many local traders who are struggling with the lack of footfall in Southend's High Street. We all need to pull together in order to get our council to listen and show more empathy for traders who work hard to make a living and who are now struggling due to the demise of the town centre. Southend has limited local industry and many local people rely on starting their own business in order to survive. These entrepreneurs desperately need the local community to support them, particularly the retail businesses/restaurants, due to the steady neglect of the High Street over the last few years! We must work together to stop this dreadful decline of our town and STOP blaming Amazon! There are many other towns locally who have thriving High Streets, so let's encourage visitors back and take pride in our town again. 2 hours FREE parking would be a great start to help these struggling traders and at the same time encourage other businesses back into the High Street, potentially creating a win-win scenario. Please download your petition now if you are in agreement or if you have other suggestions on this subject, please get in touch or leave a comment below. Let us work together to save our town, the deadline is 20th March 2019. Please use the link to download a petition form and start collecting as many signatures as possible, 1500 is needed. Please send your signed petition to Oracle House, 11 Clarence Road, Southend-on-Sea, Essex SS1 1AN. Some free parking would help to revive the high street - currently there is very little incentive to go there, as there are fewer and fewer shops. No one wants to pay to park for that. People would be much mote likely to use the high street for specific shopping/eating or encourage a browse if they could park for free for 2 hours. I agree with Bob Wilkins and John Moore's comments on how parking costs and restrictions have impacted on local residents use of Southend High Street and the Seafront. I too only venture into the centre when I absolutely have to as, apart from it no longer being a pleasant experience, there are many alternatives available without parking fees. Hopefully the Council will realise this and take positive action to encourage us local people back to revive a rather dismal town centre. I am not a member of the council or the business community. I moved to Thorpe Bay four years ago with memories of a vibrant high street, and a pleaseant seafront. I now avoid the high street as much as possible as I do not like being constantly asked for money and then see the beggars rush into Costa coffee or Weatherspoons for drinks and maybe food. I have seen the beggars at the end of the day, counting out piles of one pound coins, probably more that the average worker gets per day. If I was to throw a wrapper on the floor, I would be immediately given a fine for littering but the council seem to ignore the plies of cardboard, blankets and sleeping bags left in shop doorways. Why don't they simply collect all this rubbish and dump it, rather than leave it there making the high street one of the most unpleasant places in England. With more and more parking meters along the seafront, I tend to avoid this as well. How did such a nice town go downhill so quickly. Maybe I should have retired somewhere else?? I think it would be a great idea to have 2 hours free parking it would certainly encourage local residents as well as day trippers to go into town. I can only imagine what a devistating impact lack of parking has had on the Cliffs Pavilion since the council have made impossible to park anywhere near there now. I know from my own experience we used to regularly go there for lunch or just a cup of tea, plus the many shows we have been to there. It used to be very hard to find a seat for lunch now days it’s not a problem, and who wants to come out from a show at maybe 11 pm and go walking miles to your car, especially now when most residents don’t even feel safe during daylight hours. Let’s hope the council will listen, but on past form I do have serious doubts. John Moore a concerned Southend resident.